We had a scenerio where an 800+ line CFL routine was used to determine the optimal machine and materials. It looped through over 4000 options. Even though it was optimized and took only a second, that was still enough that we did not want it running in between every calculation. The user was agreeable to having a button that said “Click to Calculate” that would then run the optimization. We further wanted the button to disappear when it was up to date. This WIKI article describes the way we accomplished this. ActionAdd - A yes/no variable that appears to be the “button” to track when it is clicked. LastActionAdd - This stores the previous value of the ActionAdd. IsDirty - This stores if changes have occurred since the last calculations. This routine checks if the value of ActionAdd has changed from the last calculation. If it has not changed, we return the current value but set that we might be dirty. - Determine if the ActionAdd has changed by comparing it to the saved property. 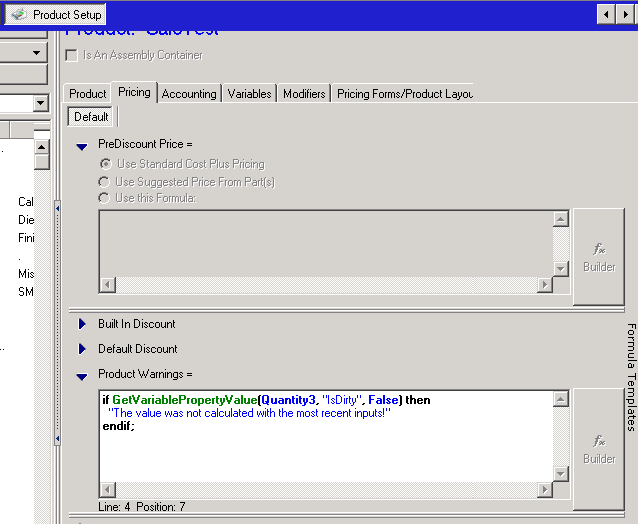 * If ActionAdd has changed, recompute the new value but also update all the tracking property variables. * If ActionAdd has not changed, return the last value but also set that you may be dirty (since a refresh was triggered by something). The code for the pricing form looks like this. I deleted some of the default properties, but Control will recreate those values anyway. Hid the checkbox itself but setting the UseCustomGlyphs to true but not providing any image (glyph) to show. ''"The value was not calculated with the most recent inputs!" That's it! Simple, right? Ok, perhaps not the simplest thing but once you get the technique down it's pretty easy to replicate it.